It was a cool, dark morning as we arrived at the start for the half marathon. 17,000 of us lined up in our corrals, ready to start running. 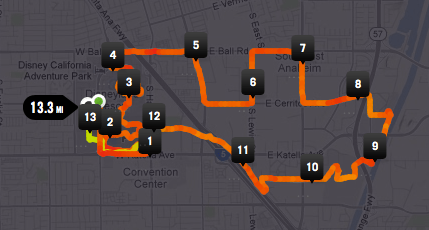 This year, I was in corral B, which is the highest I’ve ever started in a race. It was cool to actually be able to see the start line for once while waiting for the race to begin. Each of the Disney races has at least one celebrity who runs it, and is brought out to address the crowd before the race. This time, it was the str of The Goonies, Rudy and Lord of the Rings, Sean Astin. Sean has what he calls #Run3rd, a twitter hashtag about promoting positive running. As he put it, “I run first for myself, I run second for my family, and third I run for you.” The you he refers to is something or someone positive, to do good while running and support others. As I’ve written previously, I love running and encouraging others, so the idea of #Run3rd is really cool to me. The race started at 5:45 AM, with corral B starting five minutes later. Moving out through the streets around Disneyland in the darkness, a fleet of runners made our way towards 13.1 miles. In the middle of the first mile, I was running and looked to my right and saw Sean Astin. I was too far to the left side of the road and he was to the right, so I didn’t run across to say anything, but it was cool to see an actor I liked running during the race. The course took us into Disney California Adventure, starting with Cars Land and taking us around the rest of the park, including a World of Color dancing, lit up fountains at dawn. From California Adventure, we headed out and towards the Magic Kingdom. We ran through the park, taking in the sights, being cheered on by cast members, and had the opportunity to take pictures with princesses, if runners so choosed. From the Magic Kingdom, we made our way through the streets of Anaheim, where the locals watched from the sidewalks and occasional local entertainment performed. While the streets get a bit boring, it becomes exciting again to see Angels Stadium. Heading towards the stadium and out onto the warning track is still a great experience, with people cheering from the stands as we ran. 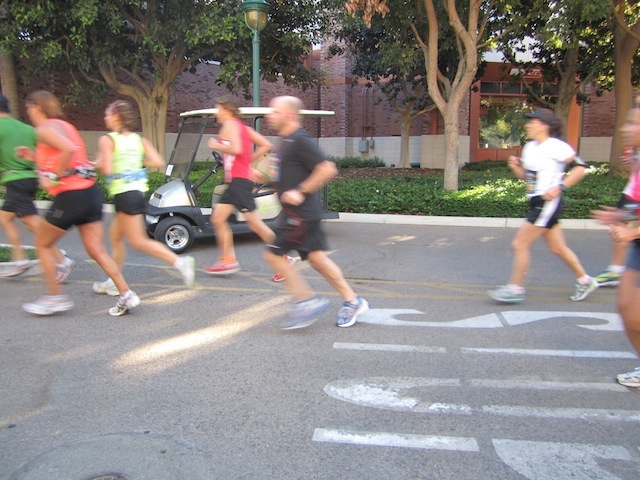 After the stadium, it is back onto the streets, but this time they were crowded with onlookers, cheerleaders, marching bands and a joyous atmosphere until we got to the finish line near the Disneyland Hotel. As I ran, I noticed on my watch that my face was faster than I had run previous races, but wasn’t feeling too warn down from it, so I kept the pace. Even as the race continued on, fatigue wasn’t setting in and as I approached the final mile, I ran even faster. All the training I had been doing with Team Determination for the ING NYC Marathon was showing when I crossed the finish line at 2:05:11. My previous best time was 2:11:00 at the Staten Island Half Marathon last year, so I achieved a new PR! 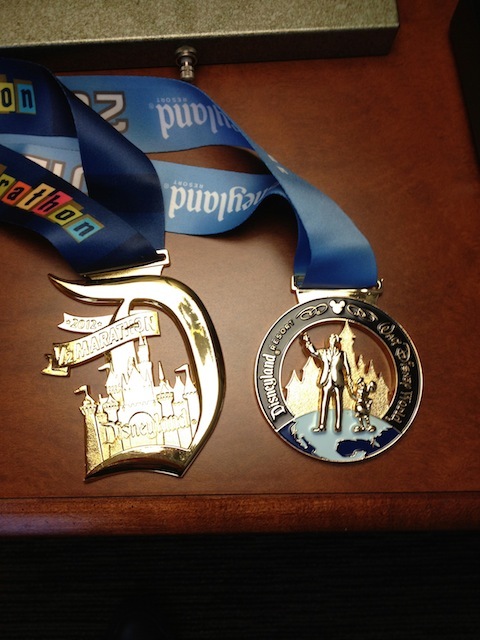 With a very successful Disneyland Half Marathon behind me, my focus is now on the ING NYC Marathon. With approximately two months left before I run 26.2 miles through the streets of New York City, my newfound best half marathon time is driving me even harder to do even better in November! And I am running with American Cancer Society at the NYC Marathon, so please support me and my #Run3rd by making a donation to help support this worthy charity here!